Are You Tired of Hitting Cellular Dead Spots On The Road? Do You Need to Be Always In Touch As You Travel? Dropped and Missed Calls Costing You Customers? Are You Tired of Slow 4G Internet Speeds In Your Car or Hotel? Do You Want to Fix These Problems - Easily? Get a Better Cellular Signal In Your Car, Truck, RV, Boat. 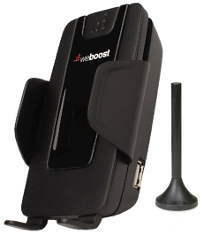 We offer several different options for improving the cell signal inside your vehicle. Each system is easy to install. Installation steps are much the same. Mount inside antenna and connect to the amplifier. The cell signal, taken from outside, amplified then rebroadcast inside your vehicle. See our Installation Information With Video. Mobile signal booster systems keep you in touch and keep you productive. Even in locations where you couldn't be before. They work for phone calls as well as 3G & 4G Internet devices. We offer complete systems. 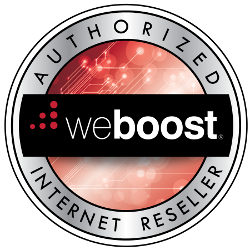 The weBoost Drive M & X (Extended Areas) systems are the most powerful. They can boost the signal to several devices inside your vehicle. They are easy to install improve voice calls and come in 3G and 4G Internet versions. These systems have an inside antenna, outside antenna, amplifier, cable and power supply. The antenna mounted on the vehicle communicates with your service provider's tower. The amplified signal is then rebroadcast inside your vehicle. The weBoost Drive S (Wilson Sleek) are Cradle Boosters. Your mobile device must sit in the cradle. The cradle has a short range amplifier built into it. The amplifier broadcasts the signal through the phone's case. They come with a set of cradle arms to fit most mobile devices. Each unit comes with an external antenna. The antenna mounts on your vehicle's roof. The unit's power comes from your vehicle's cigarette lighter or power port. These devices are powerful and affordable.